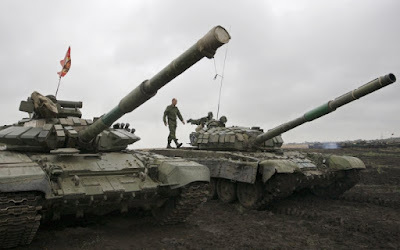 KIEV, Ukraine -- Russia’s dirty war in Ukraine is far from frozen, and despite the deteriorating situation, the West appears keen to turn a blind eye. Ukrainian officials are reporting up to 71 attacks a day, with most of the fighting concentrated around the separatist-held cities of Donetsk and Horlovka, as well as the countryside east of the Azov port city of Mariupol. According to the Organization for Security and Cooperation in Europe (OSCE), which monitors the ceasefire, last month saw the return of the use of Grad multiple-launch rocket systems and 152 mm artillery. Both were reportedly used on two consecutive days in separatist-held Horlovka. Jan. 26 and 27 saw a multitude of reports from Donetsk residents on social media of intense fighting in the north of the city, where the frontline runs alongside the ruins of the airport and the suburbs of Peski and Avdeyevka. Dozens of Twitter and VKontakte (Russia’s Facebook equivalent) users across the city reported a powerful explosion and shockwave on the 27th, for which there is still no credible explanation. Some users claimed that the shelling was the heaviest heard since the final assault on Donetsk Airport at this time last year. The prospects for another element of the Minsk process—the exchange of prisoners of war, are looking gloomy too. On Jan. 28 the head of the International Committee of the Red Cross (ICRC) delegation to Ukraine, Alain Aeschlimann, told reporters that his organization had been allowed access to only four of the 133 Ukrainian prisoners the separatists claim to hold. On Jan. 25 former President Leonid Kuchma, the lead Ukrainian negotiator in direct talks with the Russian-backed separatists, said that he now thinks that many of those prisoners are already dead. The separatists are, he suggested, using the negotiations over the number of prisoners to stall and buy time. All this comes amidst a grim backdrop. The ICRC says that over a thousand people are still missing as a result of the conflict in the Donbass, and disease, fostered by a breakdown in infrastructure and thousands of casualties caused by the fighting, is spreading rapidly. Ukraine (as well as southern Russia) is now in the grips of an epidemic of H1N1 variant flu, which has infected 18 regions of the country and killed at least 171 people. Schools have been closed indefinitely in Kharkiv. In separatist-held Donetsk, well over 2,000 people have turned to doctors with complaints of viral respiratory infections so far this year. The sister Luhansk “People’s Republic” reports an even worse situation, with more than 10,000 people infected and dozens of quarantine zones introduced. Both Eduard Basurin, a DNR military spokesman, and Vadim Solovyov, an MP in the Russian State Duma, have claimed that the flu outbreak in Ukraine originated from an American biological warfare facility in government-controlled Kharkiv. Poroshenko has said that there must be a ceasefire before the “special status” law, that would establish semi-autonomy for the occupied areas of the Donbass and establish the legal framework for local elections, comes into effect. And even if those highly contested electoral plans come to fruition, the Minsk agreements stipulate the withdrawal of all foreign (i.e. Russian) forces from Ukraine and the return of government control of all of the border with Russia before full implementation looks near. The reason for both Kerry and May’s soft approach to Russia derives from Western hopes that Putin will be of assistance in Syria. “We will continue to call on President Putin for Russia, as one of the five permanent members of the United Nations Security Council, to engage responsibly and make a positive contribution to global security and stability,” May said. But this means turning a blind eye not only to the killing of Litvinenko, but Russia’s annexation of Crimea and invasion of the Donbass for the sake of a hope that Putin may be turned to work with the West on Syria. If Russia can, with impunity, use radioactive polonium to murder a British citizen in London or shoot down a passenger airliner over Ukraine, then how can we collaborate on “serious crime” or “aviation security”? While Russia “could” play an important role in fighting ISIS, they are not and have used the cover story of doing so to further aims that run directly contrary to the (publicly stated, at least) aims of the U.K., U.S., and France. The vast majority of Russian airstrikes in Syria are aimed not at ISIS-held territory, but areas controlled by opposition groups. This includes U.S.-supplied Free Syrian Army units. When they do carry out strikes in ISIS-held land, they bomb water treatment plants and grain silos, which the Russian Ministry of Defense attempts to pass off as oil refineries. Meanwhile, there are reports that Russia actually spent the years prior to the direct military intervention last September dispatching domestic jihadists to wage war in Syria with groups including ISIS itself. It is by no means a stretch to say that the breakup of the European Union is a foreign policy goal for the Kremlin. Russia has fostered relationships with far-right Eurosceptic parties across the EU, with the virulent, neo-Vichyist Front National even receiving millions of euros from a Kremlin-linked Russian bank. Last month has even seen Russian state TV spreading a fabricated story of a German teenager being gang-raped by immigrants and the Russian embassy in London posting starkly racist tweets about Germany being trampled beneath the feet of migrants.